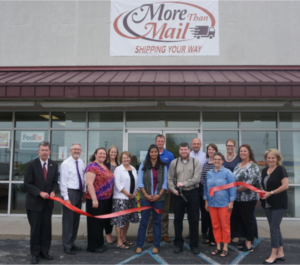 The Wells County Chamber of Commerce staff and Ambassadors celebrated with More Than Mail’s owner, Marvin Isch, with a Ribbon Cutting on May 21 at 2155 N Main St in Bluffton. The new location opened January of this year. Moving locations allowed the business space to go from 1,000 square feet to 3,200 square feet. Isch is an experienced woodworker, which now allows the business to ship freight items. Isch can hand-build the boxes to mail goods for customers. “I have a small woodworking area in the back and can make the boxes to ship items. Someday, I would also like to add a custom wood-sign shop to what we can offer as well,” said Isch. The additional space in the business will also hold for a self-serve you-pack area. “We are also a recycling center for shipping and packaging supplies. Items, such as bubble wrap, peanuts, and boxes can be recycled here, and we will re-use them for other customers and their shipping needs,” explained Isch. Post Office boxes are available for rent and can be accessed 24 hours, 7 days a week. “In the future, I will be adding a drop off area for packages after hours,” said Isch. Isch wants to create a gathering area with a homey feel in the front of the business for people to gather, sit, read, or talk by the fireplace. “People can stop in for coffee or a beverage and hang out, socialize or relax,” concluded Isch.